BRIEF CAMP DESCRIPTION: Chikopi is a unique mix of a traditional and competitive sports camp. Founded by US Olympic Swimming Coach, Matt Mann II, we are renowned for being the First Swim Camp and the oldest competitive sports camp in the World. Basketball, Football, Baseball, Soccer, Golf, Swimming, Tennis, Waterfront/Aquatics, Sailing, Volleyball, Wrestling, Team Sports, Adventure, Wilderness/Nature, and more. Archery, Aussie Rules Football, Canoe Tripping, Competitive Canoe, Cricket, Fishing, Kayaking, Lacrosse, Rugby, Triathlon, Ultimate. CAMP FACILITIES: Wood cabins, flushing toilets, hot showers, sit down family style dining hall on 400+ acres and 2000 feet of lake frontage. Pool built into the lake. CAMP PROGRAM INFO: Camp Chikopi is the Worlds first All Sports Summer Camp. Our Tradition is something that has stood the test of time. Since 1920, Chikopi, a traditional private summer camp, has offered boys aged 7-17 a warm, family environment that promotes memorable, fun-filled experiences in the Canadian outdoors. Our Program at Chikopi has developed and grown over the past 97+ years. We firmly believe in great variety and personal choice for every camper. Finding an activity where an individual can succeed is one way we help campers improve their level of self-confidence. Providing this variety helps each camper find a comfort level in our summer environment. This is one of the greatest reasons for spending summers at Camp Chikopi. It is hard for any child to have all of these activities or opportunities at home or at a vacation site. An enclosed Swimming area, Sauna, Canoe dock, Sailing Pavilion, Wind Surfing, Kayaking, and a vast waterfront, Archery, Badminton, Baseball, Basketball, Canadian Football, Cricket, Croquet, Field Hockey, Golf, Handball, Horse Shoes, Lacrosse, Mountain Bike, Rugby, Soccer, Tennis, Ultimate, Volleyball, Indoor Volleyball, Weights Room and Wrestling. Chikopi is located on 400+ acres in the Parry Sound District of Ontario, in the beautiful Almaguin Highlands, of Ontario. Voted as “one of the best boys sports camps in Ontario”. We offer over 30 land and water sports, specialize in swimming, soccer, and triathlon, include unique activities such as open water swimming, mountain bike wilderness trails, war canoe, and canoe tripping. Our swimming program covers every level; from our respected water safety and learn to swim program to our admired highly competitive swim team. No matter what level your son swims at, he will improve with our personalized program tailor made to fit his ability and needs. Campers range from boys who just want to have fun playing sports and being outdoors to those who are gifted athletes. We have programs to fit everyone's needs and fulfill their summer goals. Chikopi is very International, we are extremely proud of our diversity and inclusiveness. We enjoy the many nationalities, languages and customs at Chikopi, it is an excellent opportunity for boys to be technology free and be immersed in a variety of cultures. Our wilderness location and rustic setting add to the extraordinary experience a summer at Chikopi provides. 1. Chikopi is an amazing summer camp for boys that offers a number of activities from soccer, canoe tripping, and hiking to archery, cricket and sailing. If your son loves adventure and the outdoors, we are a terrific option. 2. Situated on quiet, clean Ahmic Lake, Chikopi is a place where boys can get away from technology and modern comforts and discover new friendships and interests in the great outdoors. 3. For something completely different, consider sending your son to our session 6 or 7, both of these sessions allows boys to live and canoe in a Provincial Park, preparing meals, performing chores and enjoying nature. Session 8 has a canoe trip on the local lakes and rivers. 4. 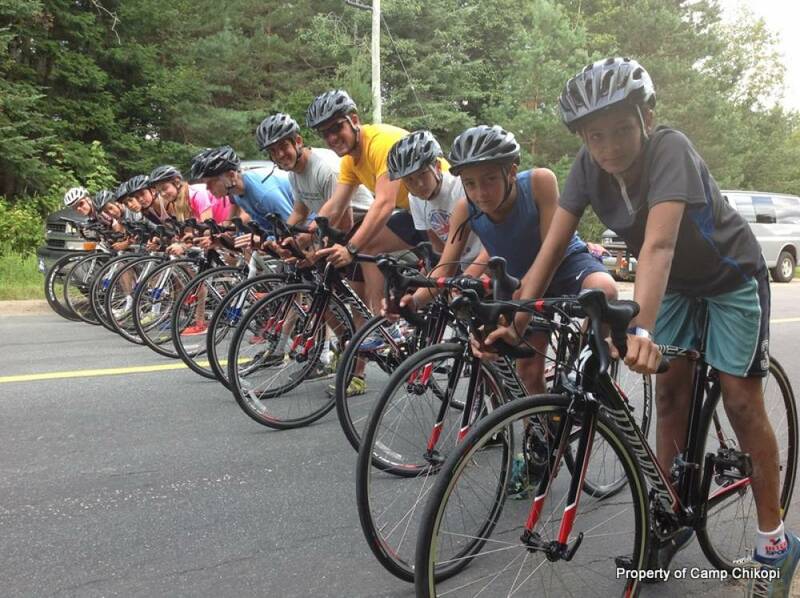 This all-boys camp in Ontario is located in the Almaguin Highlands of Ontario. Boys enjoy water sports, ball sports, mountain biking, and other outdoor adventures at Chikopi. 5. Not your traditional camp, this program is all about sports and teams. Chikopi allows kids to choose and try out different activities. 6. Located on 400 acres of white birch, maple, spruce, Douglas-fir, and hemlock, with 2,000 yards of frontage on Ahmic Lake, only three hours north of Toronto, Chikopi provides the perfect place for kids to do everything from fishing to golfing. 7. With picturesque views of Northern Ontario and an amazing program that develops core values in its campers, Chikopi is a spectacular choice for your son. From rugby to kayaking and nature studies to teambuilding challenges, your son will love every day at Chikopi. 8. So your son wants to be in the local swim team? With our rich international history in swimming, tweens and teens can learn proper stroke technique, starts and turns and so much more. 9. Located on the north south border of Ontario, Camp Chikopi is unique because it's a secular camp that teaches the fundamental aspects of good citizenship through good sportsmanship. 10. A real Sports Camp, campers at Chikopi endure a lot of physical activity while also learning how to love and appreciate their surroundings. Unique activities include open water swim races, road running competition, Team Rambo through the forest and a swim-run-canoe Triathlon. Not only will campers have a memorable time, they will build character along the way. 11. Situated on over 400 acres in the Province of Ontario, Chikopi is billed as the ultimate destination for sporty boys between the ages of 7 and 17. This overnight camp for boys has a history that dates back nearly a century. From volleyball to wrestling, the numerous available activities allow for a highly gratifying stay. 12. Chikopi is the premiere boys camp. The number of activities is endless and they offer numerous packages that can accommodate a camper of any level of experience from those who are ready for a full seven-week schedule to those want to just test it out for two weeks. 13. If you're looking for a sustainable, environmentally-conscious summer camp, Chikopi is an impeccable choice. Located among the stunning Coniferous and Deciduous trees of the north, the original Hollard farm dates back over 150 years. While the activities are numerous and entertaining, it's the playing in and interaction with nature in general that is the most memorable aspect. 14. For campers who want to shed some pounds, Chikopi has more than nine decades of experience in helping youngsters launch healthy, maintainable lifestyles. Boys of all shapes and sizes will feel welcomed and empowered. In addition to learning about eating right and exercising, campers gain social skills through fun activities. 15. Do you have an aspiring Beckham in your home? Does your child yearn to be the next Michael Phelps? Camp Chikopi is the perfect summer camp option. With more than 24 different specific areas of skill to master, campers will find the kind of sports they truly love. 16. This all-inclusive camp is only for boys and its focus is outdoor sports. The boys receive three/four lessons per day. In the afternoon and evening, there are other activities such as team games, competitions, challenges, camp fires, talent shows, skits and more. Chikopi is heaven on earth for boys who love sports and the outdoors. 17. For boys from all over the Globe, Chikopi is a highly-regarded summer camp. While the activities themselves are fun and unforgettable, the breathtaking scenery adds even more to the experience. With teambuilding outdoor undertakings, boys will see their self-confidence skyrocket as they conquer the wilderness. 18. This distinctive camp allows children to try out camp for two weeks spending their afternoons participating in activities of their choosing. Those activities include everything from team sports to swimming lessons. Chikopi is perfect for children in the Ontario, New York, Michigan, Pennsylvania areas because campers can extend by the day or week to experience more of what they are enjoying. 19. For boys who love an adventure or want to travel the world, it doesn't get much better than Chikopi. Various options include canoe tripping into Provincial Parks, English language immersion, day trip to Niagara Falls and team building experiences to prepare for high school and college. 20. Situated in the Almaguin Highlands, Chikopi and Ak-O-Mak (brother-sister camps), are approximately seven miles from one another. While different activities are offered, it's the soccer, swimming and canoe tripping that is by far the most popular at Chikopi. Chikopi has over 40 green and white, cedar stripped canoes to take onto the many lakes and rivers of the Highlands. And as if all those were not enough to convince you that Chikopi is the right choice for your son, consider this: 2014 Chikopi will celebrate its 95th summer on Ahmic Lake, Bob Duenkel has been the Director for 39 of those summers, Chikopi has been an accredited member of the Ontario Camping Association since 1962, our counselors are handpicked, homegrown from campers and each one undergoes an extensive training program and background check. Sessions range from two to seven weeks. See our web site or enrollment form for exact dates and fees. Visit: Our Camp Website Link: www.campchikopi.com. Job openings for experienced sports instructors - please email for further information. Must hold CPR and First Aid certification, and be willing to provide a current vulnerable persons background check. Go to The Best Canada Summer Camps Directory to Find More Top Summer Camps Near Magnetawan, Canada.